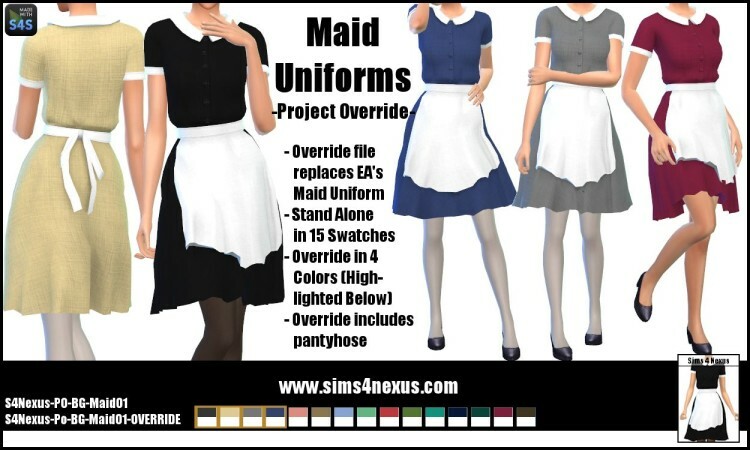 OVERRIDES- The override file will make it so that hired, game generated maids will wear this outfit. This file is the one with OVERRIDE in the title. Also note, any recolors you have of the EA swatches will then use my mesh instead, and the textures will be off. The override also has stockings included, the stand alone does not! You can download the other file, which is stand alone, and not override. You can still use cheats or the MC Command center to enable my stand alone maid uniform on your maid. The maid is base game, and no expansions are required. Only the first 4 swatches are options for the override, but if you get stand alone, you will have access to all of the colors in CAS. I don’t know where all the poses came from, if you do or want me to add a link please let me know. Thanks!